Every once in a while, we get a call to clean a piece of furniture that really should just be replaced. 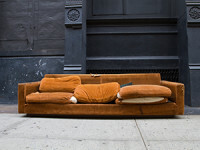 Since it would be a disservice to our client to clean the furniture knowing that it will not yield a satisfactory result, we advise the client to replace the furniture. Even though this type of situation seems to put us at a financial disadvantage, we would rather establish trust and secure future relationships with our clients than tap their pockets to make a quick buck. We want our clients to spend their money wisely and have no vested interest in recovering or replacing their furniture (we don’t provide those services). If you have a piece of furniture that has seen better days, chances are we can make it clean and fresh again — to your complete satisfaction. But if your furniture is too far gone, you can rest assured we will tell you. If you have recently replaced furniture, we will be happy to advise you about proper maintenance to ensure that you will enjoy your new selection for years to come. Customer service is a long-term commitment that requires honesty. We’ve found our clients appreciate the truth, even when it is something they don’t want to hear. For a FREE estimate on upholstery cleaning services in NY, NJ, or CT, use our contact form or give us a call 212-777-4040 | 718-776-3564 | 516-377-0993 today.